Those of us that live in Dorset know it is a great place to live. And it seems a lot of people agree with us. The Land Registry for England and Wales recorded more than 15,000 property sales in Dorset in 2017, with the total spent exceeding £5 billion. But have you ever wondered where the money is spent? Where is hot and where is not in Dorset? 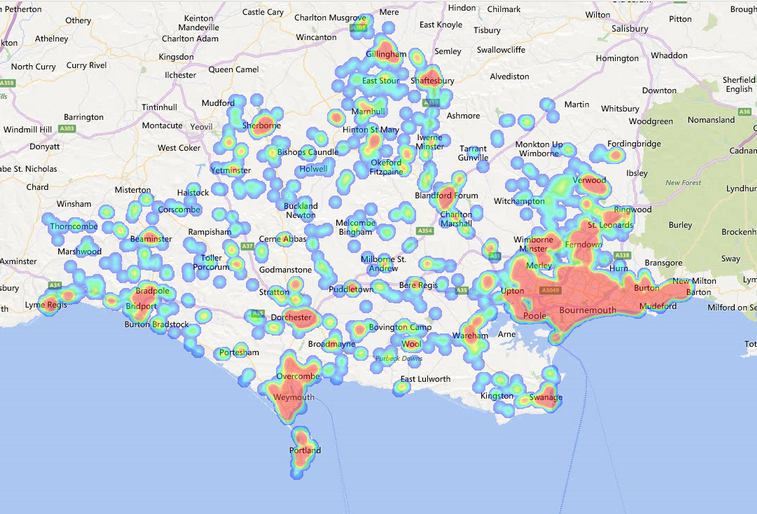 Location Analaytis company Mapcite (Mapcite.com) has produced a heatmap showing every Dorset property transaction recorded by the Land Registry in 2017. The heatmaps is a graphical representation of every transaction by value, with the more intense yellow, orange and red colours denoting areas where more money was spent buying property. As you can see from the image below, Dorset is dominated by the vast metropolis of Poole, Bournemouth and Christchurch, extending from Upton in the West to Highcliffe in the East and as far north as Ringwood and Verwood. Within the Unitary Authorities of Bournemouth and Poole, 42% of all Dorset transactions took place and £2.5bn was spent - 44% of the total Dorset spend.